It's Humans vs. Zombies in a desperate conflict to survive! Recreate the action of a zombie movie in 2 hours for 10-25 players. 139 backers pledged $5,551 to help bring this project to life. Shelter in Place can be played at a park, home, convention, as a team building exercise for a hip workplace, as a kids' summer camp game, or at a lighthearted wedding reception. J.R. Blackwell is a writer and photographer who lives in Philadelphia. J.R.’s fiction has been published in a variety of publications including Escape Pod Magazine. She is a founding member of www.365tomorrows.com. She has been role-playing since she was a child and enjoys a variety of games including table top, LARP and board games. Her main website can be found at www.jrblackwell.com. The Student: A PDF of Shelter In Place. The Doctor: A signed Shelter in Place book and PDF. The Time Traveler: A new and exclusive twist character, with special powers and unique abilities. Includes the signed book and PDF. The Engineer: The signed book, PDF and a Promotional Poster you can use for your game of Shelter in Place. 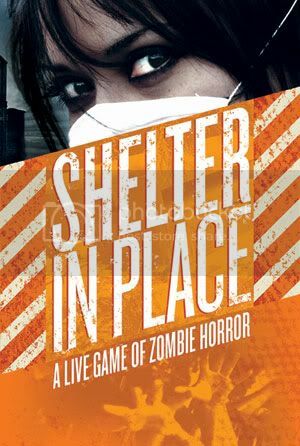 The Shifty One: The signed book, PDF, Promotional Poster and an official Shelter in Place Zombie T-Shirt. on the website. This level includes the signed book, PDF, T-Shirt and the time traveler. 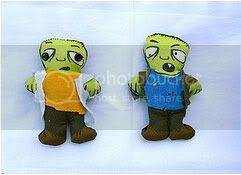 Fred the Zombie: Your very own little Zombie! Each of these Zombies are individualized with their own accessories – no two are completely alike. They will keep you company and probably won’t eat your brains. This level includes the signed book, PDF, T-Shirt and the time traveler. The Soldier: An official Shelter in Place shotgun prop, painted, altered and signed by the creator. This level includes the signed book, PDF, T-Shirt and the time traveler. 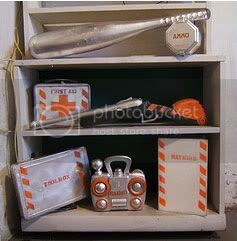 The Survivor: A complete prop set for Shelter in Place including the shotgun, radio, broken machine puzzle, box of ammo, baseball bat, first aid kit, furniture props and the toolbox. Each of these props comes with instructions for play on the prop. This level includes the signed book, PDF, promotional poster, T-Shirt and time traveler. The Director: Book a J.R. Blackwell photoshoot for a portrait or special project. This level includes two hours of shooting with J.R. Blackwell and five fully edited photos. Portrait bookings must be able to travel to Philadelphia or pay for J.R’s travel expenses. This level also includes the signed book, PDF, T-Shirt and the time traveler.